Renoir loved life. He admired the true feminine beauty. He was impressed by the glow of gorgeous skin. He was truly fascinated by the direct and very charming children’s faces, which he imprinted on his canvases. We see that this is not a classic beauty. Renoir preferred the pomp of forms. He liked a strong torso and strong arms. Before us appear ordinary girls from the village, as well as nannies and maids. 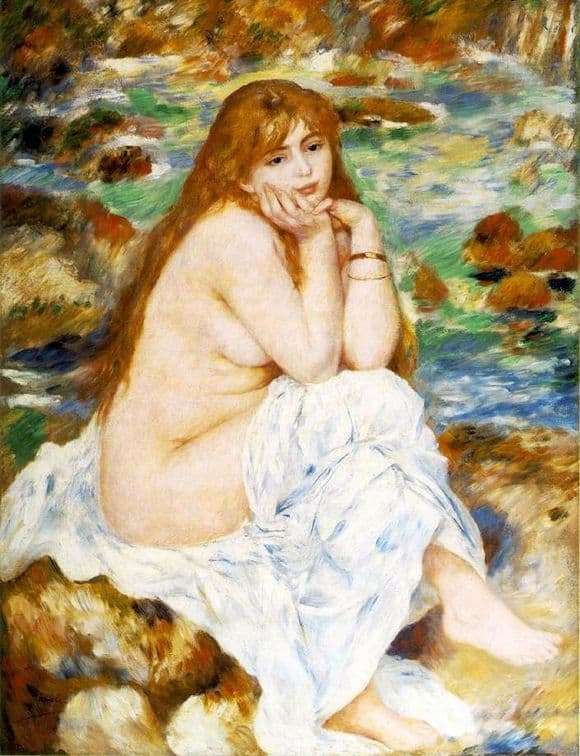 The Renoir painting depicts a red-haired bather. She is sitting on a rock and thinking about something. Her body is capable of surprising skin tenderness. This is a real beauty. Just such young charmer and liked the artist. He lovingly prescribes every curve of her body, every fold of her magnificent forms. The lower part of her body is covered with a white sheet. Renoir prescribes all the folds of the material. Every detail in the picture is tangible. The canvas affects the richness of colors that are incredibly light. Renoir prefers to write in light strokes, superimposing them on each other. This allows you to create in the picture the tone that is needed. The artist was in love with nudes. We can really feel it if we look at his paintings dedicated to bathers. It is no coincidence that Renoir created a whole series of such masterpieces. The artist uses two colors for the image of the female body – peach and pink. The bather sitting on the stone liked the painter with her spontaneity. Her expression is alive. Renoir never sought an in-depth psychological understanding of his heroines. For him it was not important. And the models themselves didn’t have this at all. A woman conquers the audience completely different. She is charming, graceful, a little naive. From her face like breathes freshness. Long red hair makes her even more charming. Renoir is a real master who painted a magnificent female body.